1. Will some of these F59PHI's be on the Rock Island District? 2. Which month will the engines arrive? Who knows, but @BusHunter seems on the right track in that the UP generally has the oldest 100s and doesn't have 400s. The UP lines have the only F40PH-2s that have not been rebuilt to F40PH-3 (150-173). These were given mid life overhauls in 2004-6. The video of the board meeting mentioned that a full rebuild at Progress Rail of a F40PH-2 costs $2.2M. Metra can get the F59PHI for $1.3M each, they have all been overhauled in the last 5 years (some as recently as last year with an average time since rebuild of 3.2 years). It is also getting increasingly more difficult to get Original Equipment Manufacturer (OEM) spare parts for the original F40PH-2 which were built in 1983. Plus you have the benefit of modernizing your equipment. I don't know if they'll have enough modern logos to stop all loco rehabs but they probably will shelve most of them. Then you could also sell the older locos and make a little money off that. Based on the Inventory and @busfan2847's comment, the purchase almost but not quite matches the number of locomotives on the UPR that have not been overhauled into PH-3s. That would seem to take care of it for a while, but then the MPs would come up. Anyone seen any of these newly acquired F59phi units recently? Still nothing new from Amtrak on the supposed new purchase. There in fact has been some locker room talk that Amtrak pulled out of the deal and wants to keep what was offered. The F59s on the property (97, 98 and 99) still have many many mechanical issues. They generally operate on the Heritage Corridor but over the past month or so, at least one has been in the shop out of service (daily) and over the past week only one has been out running with 3 F40s picking up the slack. Let's keep in mind that the Amtrak purchase is for units that are already 20 years old. Doesn't anybody think that a rehab is not far in the offing ? Might there not be a double cost involved in keeping these things running. Metra often overlooks the obvious (just look at the GPS that was overspent on yet no one ever considered maintenance after buying the garbage). According to the board presentation on the 12th, the 21 locomotives will arrive between October and December. Beat me to it, but yes, they’re here! I don't see a number; maybe someone else can. I thought I saw one on the Milw N., yesterday, but I think it was this, instead. If this is the final paint job, it has far more silver and far less orange and brown than prior designs. It is on the front below the windshield, and the rear side at the bottom of the blue stripe. Difficult to read, but it looks like “94”, possibly “84”. If this is the final paint job, it has far more silver and far less orange and brown than prior designs. They slightly modified the existing paint job to get it ready for service faster. See here. Metra said later arrivals will be fully painted in the new standard scheme. They slightly modified the existing paint job to get it ready for service faster. See here. 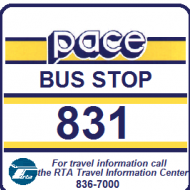 Cheaters, but I guess no different than CTA on Pace South and King County buses. It is 84. On Railroad.net 3 were reported at Western Avenue earlier this week, in Amtrak livery including 470. Here is a little history on those two! 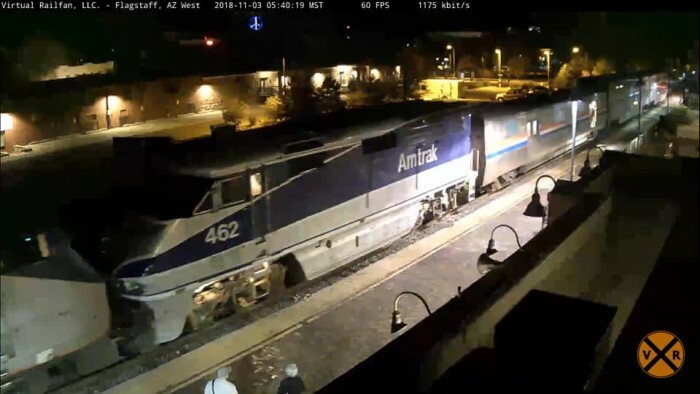 Here's one that is making it's final trip on Amtrak from Los Angeles to Chicago via the BNSF Southern Transcon before being changed to a Metra Train(video captured November 3rd at 5:40p MST in Flagstaff, AZ). Amtrack 77 at KYD yard looks as if switcher 4 just dropped it off as he was locking the yard gate. An additional three F59PH locomotives have been approved for purchase. Although the same type, the Amtrak ones seem more streamlined than, say Metra 97. The ex Amtrak locomotives are F59PHIs, while it appears Metra 97 and others are F59PHs. Not sure if the I means anything more than the new body.